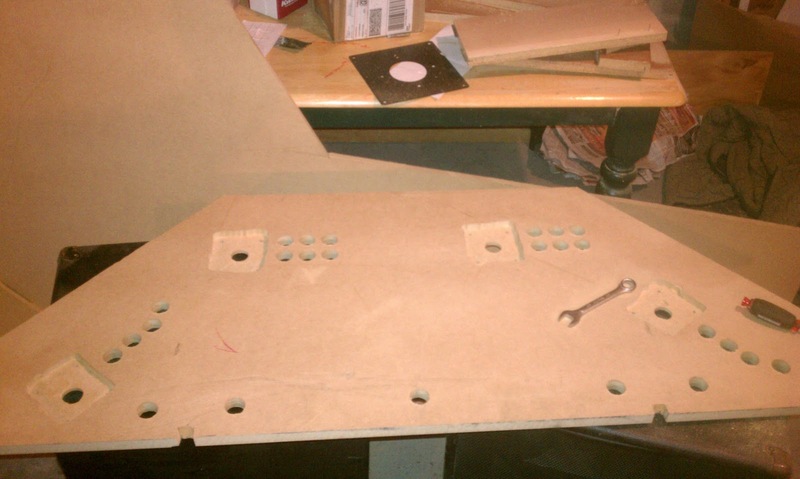 I need to now route the trackball for the control panel. I have borrowed my friends router, which he had both a table router and a hand held. Thanks Taylor! 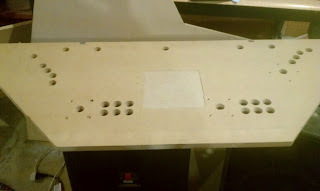 I used the handheld to route the trackball and the joysticks, and I will be using the table router to route out the t-molding. I first started with routing out the trackball plate. This is what the plate for the trackball will lay into, I must admit that this was the first thing I routed out, and it should have been the last as I messed up some of the edges. Live and learn. I then went through and routed the joystick controls on the bottom of the control panel. This allowed the joystick handles to sit up higher when going through the 3/4" mdf wood. 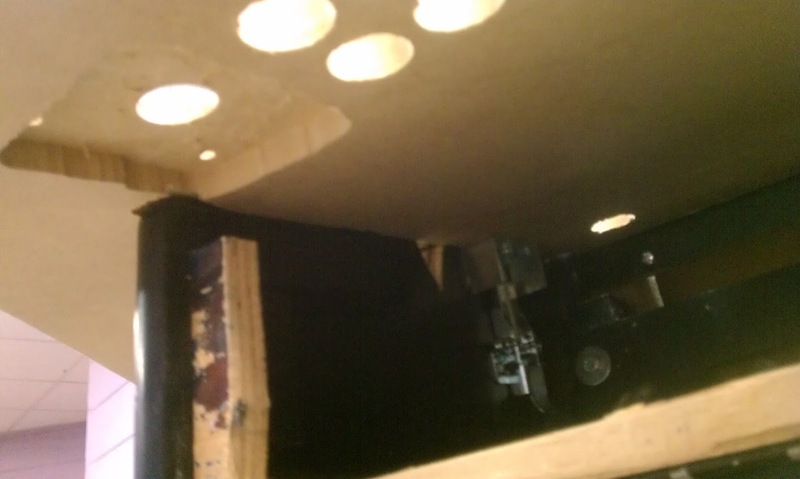 I now need to cut out the trackball area where the actual track ball will go through. 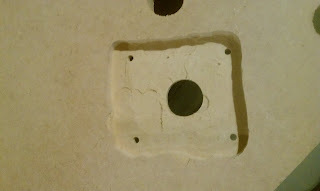 I borrowed my father-in-law's scroll saw to do this job. Thanks Chris! 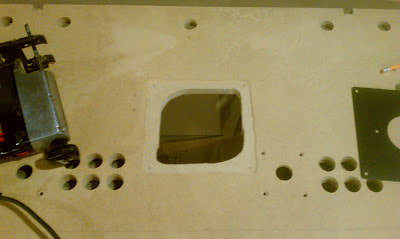 I first drilled holes at the points where I would be "turning" the blade, and then went through and cut my hole. I need to modify the cabinet some to allow me to mount the new control panel. First I need to take off the front "plate" of the cabinet so my new control panels buttons and joysticks won't be laying on this. 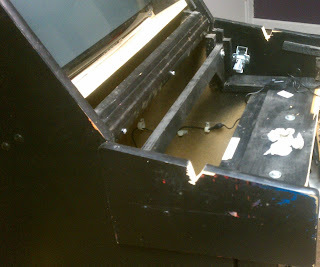 I used a hand saw to remove the front, and also to cut notches on the sides for my wiring to go through for players 3 and 4. 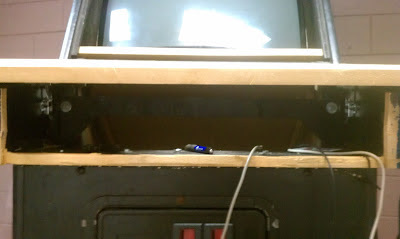 I then took the old metal straps that held down the original control panel, and mounted them onto the new control panel. 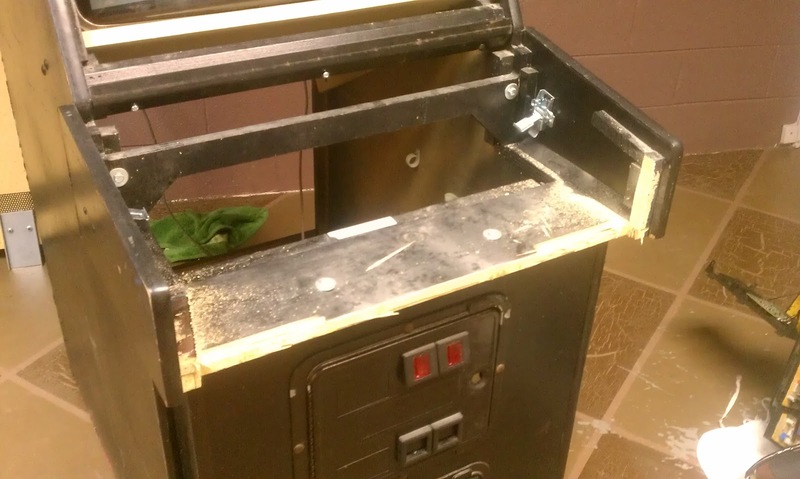 I had to move the actual cabinet connectors on the cabinet up an inch so they would be able to lock down into place. 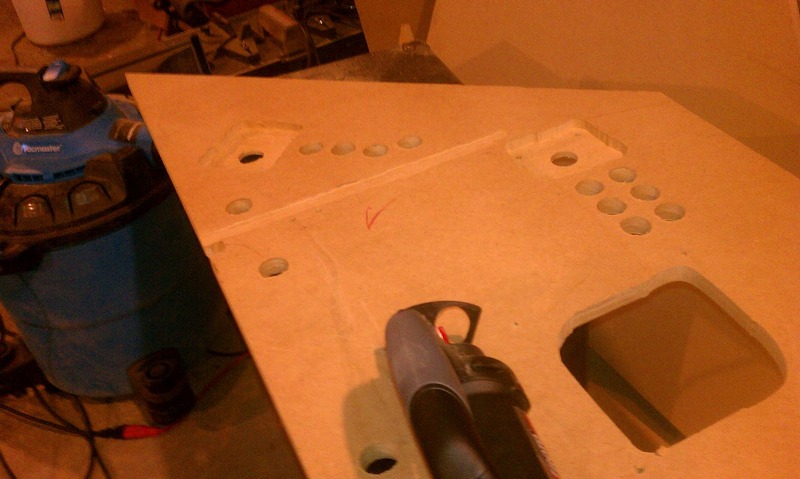 I also routed out a line for the control panel to sit into on the cabinet. 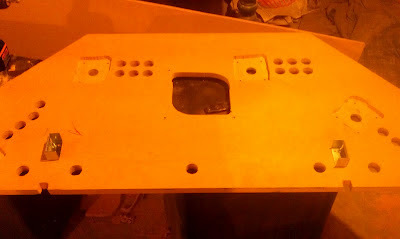 With all of this the new control panel sits very nicely on the cabinet, and locks into place firmly. With all the holes cut and most of the routing done, I will start working on the wiring and assembly to give the arcade a good test run! Until next time!